Executives understand that having an outstanding team is essential to success. Furthermore, in today’s war for talent, the competition for landing top professionals is fierce. GenX and Millennials expect their managers to be accomplished coaches actively involved in their development. Having great internal coaches to develop employees is not only cost-effective, but it also an indispensable companion to any leadership and managerial development program. Performex leverages proprietary methodologies and advanced coaching techniques to develop even the most challenged managers into successful workplace coaches. This 8-hour workshop will equip your team with the tools necessary to successfully coach even the most difficult employees. Participants will receive reference materials and gain hands-on practice with the proven 6-step Performex Coaching Process. Participants will practice advanced questioning techniques and storytelling, both of which are essential skills to positive coaching outcomes. 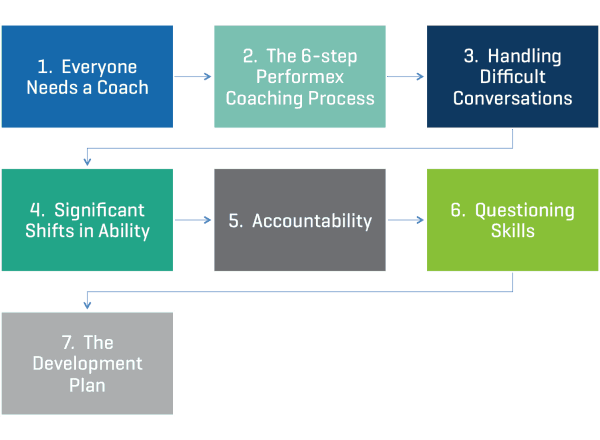 Following the workshop, each participant gains access to a one-hour consultation with a Performex Executive Coach to hone coaching skills and/or address specific coaching needs of their assigned managers to coach or mentor. Do your managers coach their team members to maximum potential? Contact us to discuss a Workplace Coaching workshop for your organization.